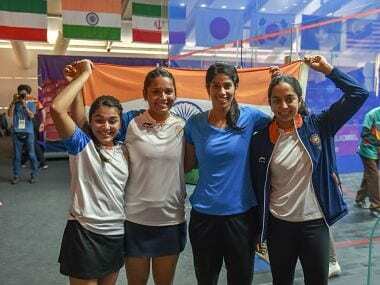 Jakarta: The Indian women's squash team finished second best to a clinical Hong Kong in the final, winning silver at the 18th Asian Games on Saturday. The first singles was between the weakest players in both teams with World No 88 Kuruvilla taking on 51st-ranked Tze Lok Ho. The young Indian had come from behind to beat Ho in the group stage. It was the biggest win of Kuruvilla's career and she was also the sole victor for India in the match with Chinappa and Dipika Pallikal losing to Annie and Joey Chan respectively. Today both Kuruvilla and Ho played in the same fashion as they did on Thursday. Not the swiftest of movers around the court, they often came in way of each other, leading to plenty of let calls and strokes which were mostly awarded to the Hong Kong player. The umpire even warned Kuruvilla multiple times to not obstruct her opponent. The first game was evenly contested while Ho ran away with the second one to make it 2-0. The third one was fiercely fought. The Indian's perfectly-placed nick off the backhand gave her the game ball on 10-9 but Ho made it 10-10. Kuruvilla won the next two points to make it 1-2 in the opening singles. The Indian, however, trailed 3-9 in the fourth game and could not produce another fightback losing 8-11, 6-11, 12-10, 3-11. Next up was a must-win match for India as Chinappa, conqueror of eight-time world champion Nicol David in the semi-finals, faced familiar foe Annie. The World No 11 had thrashed the 16th ranked Indian on Thursday, leaving her in tears. The way Chinappa was outplayed in the first game, it seemed like a one way traffic again. The second was much more competitive but Annie's relentless attack paid off as she took a 2-0 lead in the best of five affair. Annie raced to a 10-2 lead in the third game and it was all over for India. Chinappa lost 3-11, 9-11, 5-11. For the record, Indian players, who were unhappy with regular coach Cyrus Poncha and had demanded a high standard foreign coach, played without a proper coach in the competition and relied on each other for tactical and technical advice.